MC-13S is the latest upgraded version of MC-10L. Class A push-pull power amplifier to reduce distortion. Ultra linear push-pull amplifier provides greater output power. Caution : the product don't have plastic cover. YAQIN MC-13S Push-Pull Integrated Stereo Tube Amplifier. Like new condition. All original contexts and box included. Other Notes: "Peachtree Audio has raised the bar with the Nova. Consider the Nova if you’re looking to improve your computer-based or streaming audio to a “high-end” performance level. The Nova is a world class 80 watt per channel integrated amplifier with a built-in high-performance digital-to-analog converter. Low-frequency driver enough, rich tone. Pre-amplification part use SRPP circuit, so the machine has a large frequency response, low distortion, low internal resistance. Output Power : 12W 12W (4Ω-8Ω). Integrated Amplifier. 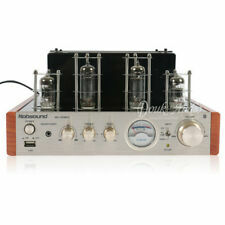 Hi-Fi Tube Amplifier. AV Tube Integrated Amplifier. Digital Amplifier. Headphone Amplifier. Aluminum Chassis/DIY Enclosure. Bluetooth Audio Devices. Enjoy the sound, style, and convenience of a hybrid tube amp with Bluetooth. I heard one of these in action and brought it in and it does not disappoint. Incredible power section of KT150 tubes. 40W of tube power per channel. Incredible build quality. This amp beat out Mcintosh in an A-B comparison. Itcannot be used with 120V power. Trade: Make your budget go further with a generous trade-in allowance. Let us know what you have available, and we’ll get you the best possible trade-in allowance. Full 2 yr MFG. Black faceplate. subwoofer output. Nobsound®——Douk Audio. This is our Douk Audio 2016-4-7 new desgined tube amplifier, mini size with elegant appearance, warm tube sound and c ost-effective, why not try to buy it?. HiFi Art-Elfidelity. 1.MC-13S is the latest upgraded version of MC-10L. A YAQIN MC-13S unit. 3.Class A push-pull power amplifier to reduce distortion;. Ultra linear push-pull amplifier provides greater output power;. Distortion of Harmonic Wave: ≤0.9% (at 28W). HiFi Art-Elfidelity. Integrated Amplifier. Hi-Fi Tube Amplifier. AV Tube Integrated Amplifier. Digital Amplifier. Headphone Amplifier. Audio HiFi & DIY. Aluminum Chassis/DIY Enclosure. Connectivity Wireless: Bluetooth® v4.0, aptX®. "After letting the tubes warm up we are firstly playing music from a smartphone via wireless Bluetooth. MISTRAL system shows a combination of good dynamics and resolution.